Stay ahead of the game in the Nike Outrider. Classic aviator style upgraded with modern Nike technologies. Outrider inherits Nike Max Optics for visual clarity you depend on inside a durable frame. A floating rubber nose pad offers added ventilation without sacrificing style and performance. 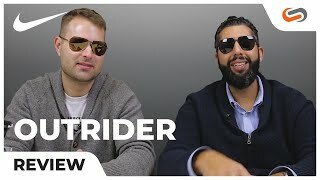 Wear Nike Outrider all day, every day. Air pocketed cushions on the temples provide sure grip comfort for every occasion. Be the first one on the course and the last one to leave with Nike Outrider. Vision is performance.